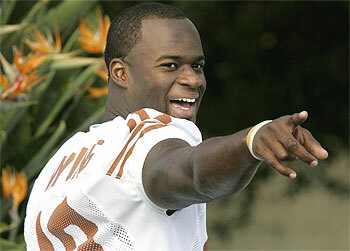 Vince Young appeared on CMI: The Chris Myers Interview just before the NFL Draft. They talked about the Rose Bowl, his future in the NFL, Reggie Bush and how he'll take care of his family once the paychecks start rolling in. Vince on his throwing style: "There are a lot of different quarterbacks doing a lot of different things. What ever it takes to get that ball to that guy, in his hands at the right time, that's what I'm going to do."